KIRF's three volunteers, Mark, CJ and Patrick, will be distributing the food supplies they purchased yesterday in the DR, today in Port-au-Prince (PAP). They spent last night in the city at Patrick's Haitian friend's house that has a security gate. There, they were safe as well as their rented van that was packed with food relief and requested supplies such as water filters, etc. Their goal is to distribute the first load of food supplies today with a local Haitian aid group. 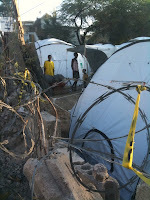 Tuesday and Wednesday they plan to distribute the "new and almost new" children's shoes and water filters in an outlying tent camp. Getting around PAP is horrendous with the stop'n'go traffic of people and vehicles crowding the roads. The roads are lined with the rubble of leveled buildings and there are few street signs which has made CJ's job as Navigator and Logistics Manager challenging to say the least. Mark, who is doing the driving, said, "The issue right here is not the food, it's the distribution and money. It's a big logjam here." It took him three hours to drive a few miles and fill up their van with gas this morning. He ended up driving eight hours yesterday. They will distribute their first load of food and supplies through the secure warehouse facility of their Haitian host, who is business owner and, after the earthquake, a local disaster relief specialist for a local informal aid network in Port-au-Prince. 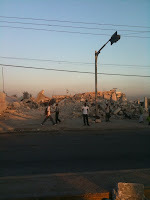 Nearly all of his employees lost their homes and some family members to the terrible earthquake of Jauary 12th. The KIRF volunteers are trying to source food and requested living supplies locally in Haiti from now on. That way they help the small local vendors and their families AND they help the hungry and homeless when they distribute the supplies. Much of the time, these groups of people are one and the same. They are working with a local Haitian aid group who is proving invaluable assistance with local contacts, need assessment, security and manpower preparing family care packages of supplies for the homeless. They will be distributing aid directly to those in need the most: hungry, homeless and sad groups of families living in their ad hoc tent camps all over PAP and just outside the disaster zone. It is safer for Mark and his volunteers to work with small groups of earthquake survivors. It is also partnering with the local community and utilizing the informal aid networks of neighbors, local caregivers, health workers, friends and family members. It is more efficient and these people know each others needs better than some strangers from outside Haiti. There are several international food distribution centers inside Port-au-Prince but the aid is not reaching many areas where people have fled the disaster zone and have no transportation. The inadequate distribution is similar to what happened after Hurricane Katrina in MS and LA that I witnessed. The lack of road access and lack of transportation has made sourcing food and water each day for many homeless impoverished families exceedingly difficult. There is also a shortage of petrol that is further inhibiting aid distribution. 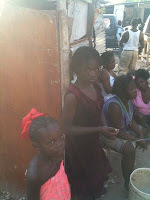 However, the Haitians are working hard dealing with a horrible situation, to get aid distributed where it is needed. PAP is a very urban, very chaotic, and a very crowded city Mark told me. However, the Haitians are nice, helpful and grateful for the assistance. He has witnessed "no aggression whatsoever." He has heard of and witnessed instead, countless small acts of kindness: neighbors helping neighbors, strangers helping strangers.